Sophomore forward Gary Johnson has become one of the team's most consistent scorers. 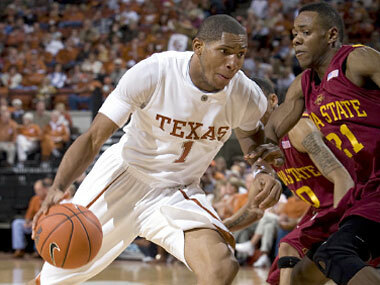 The Texas Longhorns scraped by a game [tag]Iowa State[/tag] ball club to win their conference opener 75-67. The game came sandwiched between a loss to Arkansas and a looming Big Monday showdown in Norman against the top-ten ranked Oklahoma Sooners. All of Texas’ losses have come away from the Erwin Center. The Longhorns continue to struggle from the perimeter. Teams are proving that [tag]AJ Abrams[/tag] can be taken out of Texas’ half court offense and the guys around him do not have the skill set to consistently knock down three-pointers. Texas ranks last in the Big 12 in three-point shots made. It is likely that Abrams and the other Horns will regain confidence in their outside shot. As conference play begins guys like [tag]Damion James[/tag], [tag]Conner Atchley[/tag], and [tag]Justin Mason[/tag] will get better as they play familiar foes. The problem that appears to not have an answer on the roster is at point guard. Abrams doesn’t have the ability to play there against high level opponents and Mason for all his strengths is not getting it done. Bench players like [tag]Dogus Balbay[/tag] and [tag]Varez Ward[/tag] are not consistent enough yet to be counted on. Balbay has an even worse jump shot than Mason and Ward doesn’t play the defense Barnes expects for an on ball defender. The disadvantage of not having an explosive point guard has been evident in the late part of Texas’ losses. All three losses were determined in the last minute of the game, and all but maybe [tag]Notre Dame[/tag] could have been won with better offensive execution. The Longhorns can’t get easy shots. They can’t get them for themselves and they can’t get them for their teammates. With all the good things this team does it won’t mean much come March if the point guard doesn’t become a factor for this team. The saving grace for this team and the one thing that makes them dangerous come tournament time is their ability to match up and play on ball defense like no other team in the country. Damion James playing at the three has not paid off completely on the offensive end, but it has vastly improved the total team defense for this team. Last year Mason was guarding small forwards, he now guards the point guard. The length James adds to the lineup at the three position helps with tip balls, help defense, and rebounding on both ends. Texas does a great job with help defense for the most part. The negative that comes out of that is they occasionally find themselves out of rebounding position. Texas allows too many put backs. Over the last few games [tag]Gary Johnson[/tag] has emerged as a weapon. The sophomore is sliding into the role James abandoned when he moved to the wing and he is quickly becoming a major factor on offense. Lately, Johnson has been the go to guy and the most consistent player on the offensive side. He rebounds with ferocity and hustles at all times. Barnes will rely on him more and more because of the emergence of his mid-range jump shot. Johnson has a high release which allows him to get it off every time without the threat of a rejection. 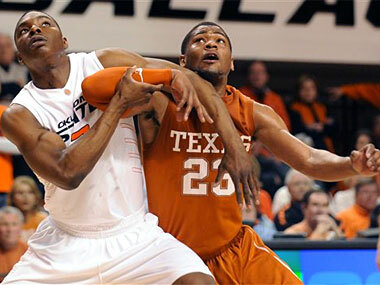 He will have to be huge on offense and defense against Blake Griffen for Texas to have any chance against Oklahoma. Another player that needs to step up in the middle is [tag]Dexter Pittman[/tag]. The big man is a mismatch for everybody on the court. The work he has done in the weight room cannot be understated, but he has to avoid the cheap fouls that prevent him from finding out how many minutes he can play. When he is on the court he opens up the outside, shots that will eventually begin to fall. The Longhorn outside shots are not going to come from drive and kicks, they will come from the post. The more attention that has to be paid to Pittman, Johnson, and James the more space Abrams will have. No doubt this is a down year for Texas. And by that I mean their ceiling isn’t as high as teams of the past. But it says a ton about the program, coaches, and players that a down year fields a conference championship contender, a top-ten ranking, and a good shot at going to another Sweet 16. We just watched a football team overachieve for a full year, maybe the basketball team will do the same. AJ Abrams will need to more than score this year. Texas enters the upcoming basketball season ranked in the top ten and poised to make another successful tournament run. Rick Barnes wants his team to be tough and physical, winning games on the defensive end. This team may represent that more than any team he has had in Austin. The Longhorns come into the season with nine out of their ten man rotation from last year. The team only lost one player, but it might have been the worst possible one to lose. Point guard [tag]DJ Augustin[/tag] now plays in the NBA and Texas will spend the early part of the year figuring out who will control the ball. [tag]AJ Abrams[/tag] wants to play more point, but the team plays better when he plays off the ball and [tag]Justin Mason[/tag] runs the point. The addition of Turkish slasher [tag]Dogus Balbay[/tag] may provide the answer when it is all said and done. Here is a breakdown of what to expect from the starters. We’ll look at the bench players in an upcoming feature. [tag]AJ Abrams[/tag] – Abrams has already become the most prolific three point shooter in school history. In the off season the former McNeil star tested the NBA waters and what he found was that his only chance to make a living in the league is to become a point guard. Abrams is too small to play the two in the NBA, but he fits perfectly into the role at the college level. After thinking about making the jump, Abrams decided to return for his senior year. [tag]Rick Barnes[/tag] has allowed AJ to play more point in the off season, but it is a position that AJ failed to play well at even in high school. It is likely that Texas will rely on a point guard by committee until someone steps up in the role. Expect Abrams to play the point more early in the season than he will as it gets into February and March because Texas will need him to do what is best for this team and not what will give him the best chance to get drafted. [tag]Justin Mason[/tag] – Mason is the classic Rick Barnes guy. He is more junk yard dog than basketball player. Mason is by far Texas’ best perimeter and may end up being the guy that handles the majority of the point guard duty. He isn’t going to “wow” anybody with his ball skills, but he is a solid player that plays his hardest on every possession he is on the court. Mason fits perfectly into the style of play this team is going to have to adopt to be successful. Texas is going to have to dominate on the defensive end, rebound, and fight for points on offense. There is no doubt that the talent level at the lead guard position will take a hit with the loss of Augustin, but the steady play of Mason should provide the Longhorns enough ability to make a serious run at the Big 12 championship. Mason’s stat line isn’t going to blow anybody away, but he does so many things well he is going to be invaluable for this year’s team. [tag]Damion James[/tag] – James made the transition from inside player to wing player last year and it could end up being the best thing that has happened to this team heading into this season. His freshman year was spent collecting rebounds and scoring put backs as [tag]Kevin Durant[/tag] dominated the ball. When Durant left, UT needed a big player on the wing. James made the transition with ease. He ended up being one of the only players in the country to average a double-double and enters the season on most people’s All-American watch list. James could up being the most important player on the roster. His play will be a huge determinate of where this team ends up. If he can continue to be a force on defense and the boards while keeping his three point percentage up Texas will be a nightmare match up for most teams. James has struggled creating offense off the dribble, but summer reports had him working tirelessly with Kevin Durant on just that, and if he puts it all together he will likely be a lottery pick in next year’s NBA draft. [tag]Clint Chapman[/tag] – Heading into the season most thought [tag]Gary Johnson[/tag] would start at the four. Against Stetson Chapman got the start. Chapman isn’t a better player than Johnson so the thought must be that Chapman compliments the starters better and Barnes wants Johnson to be his sixth man off the bench. Chapman is going to give you hustle, rebounding, and the occasional bucket around the basket. Barnes is not going to draw up many plays for the sophomore from Oregon, but he does have the skills to score if given an opportunity. The Longhorns need length in the front court and Chapman may give them more of that than Johnson. I wouldn’t think he’d stay in the starting lineup for the whole season as Barnes may look to change who starts at the four depending on practice and game performance on a week by week basis. Texas has a lot of options at the position with Chapman, Johnson, and [tag]Alexis Wangmene[/tag]. [tag]Connor Atchley[/tag] – Atchley was the biggest surprise on last year’s team. He provides match up nightmares because of his ability to step out and nail the outside jumper. Atchley also proved he could provide defensive help by leading the team in block shots. He isn’t the most physical player, but the roster has plenty of those. Atchley just needs to continue to do what he does best. He stretches the defense and has even worked on a sky hook. Barnes may trust Atchley more than any other player on the roster and with the loss of Augustin will look to the senior for on court leadership. Especially in the front court where there are talented, but young and inexperienced players behind him. Atchley is best suited to play at the four, and we may see a little of that if he is paired with [tag]Dexter Pittman[/tag] in the front court. Texas’ most dangerous lineup would be Abrams and Mason in the back court with James, Atchley, and Pittman playing in the middle. After playing well in hostile territory in the first two rounds, the Longhorns come home to Texas for the Sweet 16. On Friday the Horns will take on [tag]Stanford[/tag] in a 2 vs. 3 match-up in Houston. The Cardinal pose the biggest challenge in the tourney yet for Texas, particularly the giant Lopez twins down inside. The 14 feet of Lopezes in the paint means the Longhorns need a big game defensively from the likes of [tag]Connor Atchley[/tag], [tag]Damion James[/tag], [tag]Gary Johnson[/tag], [tag]Alexis Wangmene[/tag], and big [tag]Dexter Pittman[/tag]. On the offensive end Texas needs another hot shooting night out of junior guard [tag]AJ Abrams[/tag], but open looks won’t come as easily as they did in the previous two games.